Natural scientists are now daring to study one of the last fields to have eluded them for so long: faith itself. This, of course, threatens faith and philosophy’s hold on the definition of man and his place in the world. This is a main reason why Harris, Dawkins, and Dennett are debated so fervently. Is religion a destructive force? The debate over Fundamentalism and the new Atheists overshadows the scientific research on faith. 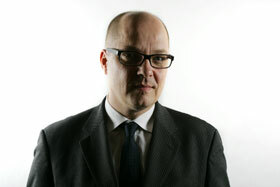 ANDRIAN KREYE, from 1987 to 2006, was the US cultural correspondent for the Süddeutsche Zeitung (currently the largest German-language daily). 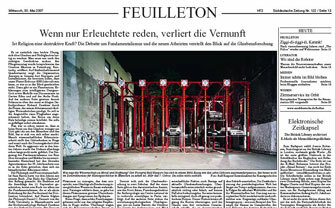 At the end of 2006, he moved from New York to Germany, where he took over the Feuilleton section of the newspaper (part Arts & Ideas, part Op-Ed section). He is also an Edge contributor. It is of course easy to poke fun at belief and nonbelief. One need only look for the right stories. The Monday of Pentecost marked the opening of playground that is the Creation Museum in St. Petersburg, Kentucky. In a space of 5,500 square meters, the organization Answers in Genesis has mounted exhibits and installations that are supposed to prove that our planet can only be 6,000 years-old, just as it says in the Bible. It also houses a Planetarium, as well as installations that educate about the intelligent designer God — such as model dinosaurs in the Garden of Eden, and even on Noah's Ark. On the other side of the spectrum are the stories about Oxford professor Richard Dawkins, who supposedly preaches his Atheism sometimes in outburstsof fury. There's story circulating that he scolded an airport attendant that her cross (necklace) insulted his intelligence and that he asked her to remove it. The disputes over faith has always been less about God than about Man and the image he makes of himself. Many cutting edge scientists have questioned the existence of God and thereby the dominion of the Earth. As heated as the dispute has been over the past year, for a long time it had disappeared from discourse. The triumphant advance of fundamentalism from Rome and Jerusalem to Mecca and all the way into the American heartland drove the liberal Agnosticism of the 20th century so far into a corner that there's a new and militant atheism rising in defense. The philosopher and neuroscientist Sam Harris created the first spark three years ago with his book The End of Faith. Written in reaction to the desasters of September 11th. The book focuses mostly on the fundamentalists, whom he sees as an acute threat to the continuation of civilization. On his heels came philosopher Daniel C. Dennett of Tufts University in Massachusetts, and evolutionary biologist Richard Dawkins of Oxford University. In his book Breaking the Spell, Dennett presents religion as an explanatory mdel, which had been made null and void by scientific advances by the 19th century. Dawkins goes a step further in his book The God Delusion and directly takes on all people of religious faith. Not only are they irrational, they are all too destructive, he writes. Only an end to all faith can enable the progress of mankind. Just now the essayist and cultural critic Christopher Hitchens has joined the scientists' ranks with his polemic God is Not Great: How Religion poisons Everything. In it, he picks apart the myths of faith and religiosity with rhetorical brilliance. Nobody can provoke the public with more mastery than Christopher Hitchens. For instance, he gives his chapter on Islam the title, "Was Mohammed an epileptic?" Hitchens cannily refers to the "heartless Christians", who he contends bring to mind the enlightenment of the prophets in the tradition of the enlightenment of St. Paul on the road to Damascus. To this point he connects all such points of contact between research and belief that render the current debate explosive. At Laurentian University in Toronto, the movement has long centered around Canadian neuroscientist Michael Persinger. Persinger developed a helmet device that creates a magnetic field with which he can stimulate the temporal lobes of his subjects. In this way he can successfully trigger the experience of a presence in the room corresponding to what believers describe as a genuine godly being. Persinger explains that the characteristics of this experience overlap with the symptoms of epilepsy. There is no question that that the results of such research call into question more than just religious experiences. Natural scientists have long grappled with topics that question not only belief, but also the accepted view of human nature. The first research results to present free will as the pure function of genetic and biochemical sequences were decried not only by representatives of religion. For instance, neuroscientist Steven Pinker of Harvard University likes to dismantle the Enlightenment's stalwarts like the blank slate myth with scientific arguments. If the conclusion is drawn,that it's alright to control the human spirit by means of psychopharmacology, even secular circles see it as heresy in the process of building free will and character`. However, science is not inherently in conflict with faith. For example, Darwin was convinced that belief in an all-encompassing spiritual God was a universal phenomenon. There is divergence from the hard-fought battle being waged by these atheists against the threat of desecularization the attacks against reason and rational thinking. Behind this fight of current urgency there is a scientific revolution in the making. Soon, not only man, but his faith and spirit will be explained scientifically. At present, research on faith is divided into two camps. On one side is the Darwinist approach, which is that of Scott Atran, a research director in anthropology at the National Center for Scientific Research in Paris, France. On the other side are those who take into account evolutionary psychology, such as Justin Barrett, Director of the Centre for Anthropology and Mind at Oxford University. In the early seventies, Scott Atran was already asking why since primeval times humans have worked so hard to overpower their need for rational explanations with their faith. Why, he asked in his book In Gods we Trust, are societies ready to pay such a high price for faith, when it costs them valuable resources like time, energy and materials? What threats to survival could be warded off by means of faith? What function does faith serve to the individual and to the collective? And why have religious communities historically shown better chances for survival? Soon after, Darwinist faith research emerged and placed faith firmly in the realm of consciousness, asserting that it was not the pure product of cultural influence and education. However, they could not identify a function that would make faith an evolutionary advantage. So they concluded that faith must be a byproduct of evolution that originated as the result of some earlier, now-gone function. Nevertheless, Scott Atran was certain of one thing: religion has always played a role in the history of mankind. This is his biggest critique of Harris, Dennett and Dawkins, with whom he has been in a heated debate over the past year. He argues that he isn't questioning the motive for their call to free the world from dogmatic belief systems that are barbaric, anachronistic and inhumane. But the Neoatheists are not presenting adequate scientific facts, or conclusions drawn from actual faith research. Belief systems by their nature can be neither strictly true nor false, however meaningless. They can't be necessary, but they can serve a practical purpose. And often enough, these purposes can outweigh the cost, because faith has the capacity build strong, interconnected communities, which in the world of Darwinian competition can help them outsurvive other communities. Such undogmatic considerations can be also found among evolutionary psychologists who share Justin Barrett's approach. This camp sees faith not as a strategy for the survival of communities, but as a developmental stage of the human psyche above all. With simple experiments, Barrett has proved that children at the age of three or four years still possess an unwavering faith in the infallibility of their mothers. Only at age five or six do their own individual wills and their own personal knowledge begin to dissolve this faith in their mothers' omniscience. Even these two explanations cannot get to the heart of theology. On the contrary, dogmatic atheism yields findings that can serve as the foundation for a deeper investigation of religious communities, whether it be a radical subculture like the Islamic suicide bombers—or broader movements like the victories of the religious right in American politics. He who reaches an understanding of the bombers' salvation and of the motivational powers of the Christian fundamentalist voting ranks can also comprehend the historical developments. The Neoatheists' anger is nevertheless understandable. It is not just the scientists who are engaged in this vicious culture war. The desecularization of the post-ideological world has recently gained so much momentum that it has created a substantial following for secular worldviews and for Science. This may not be obvious to the European at first who may be blinded by the advances of the most radical belief groups—for example, the rise of Hamas in Gaza, or the desularization of American society. But even in Europe the culture wars smolders. Last fall, Pope Benedict XVI stated clearly, at a conference at the Castel Gandolfo addressing the nature of evolution, "It is not yet the time to reconcile the two domains." And: "This is in the interest of regaining a dimension of reason, which we have lost." One advantage faith has over atheism is that it offers hope for an afterlife. Thus far, we have found only religious answers to assuage the fear of death. It always comes down to a choice between delusion and reality. Reality just may make you love your live so much more.